Ian Lewandowski is a photographer from Northwest Indiana. 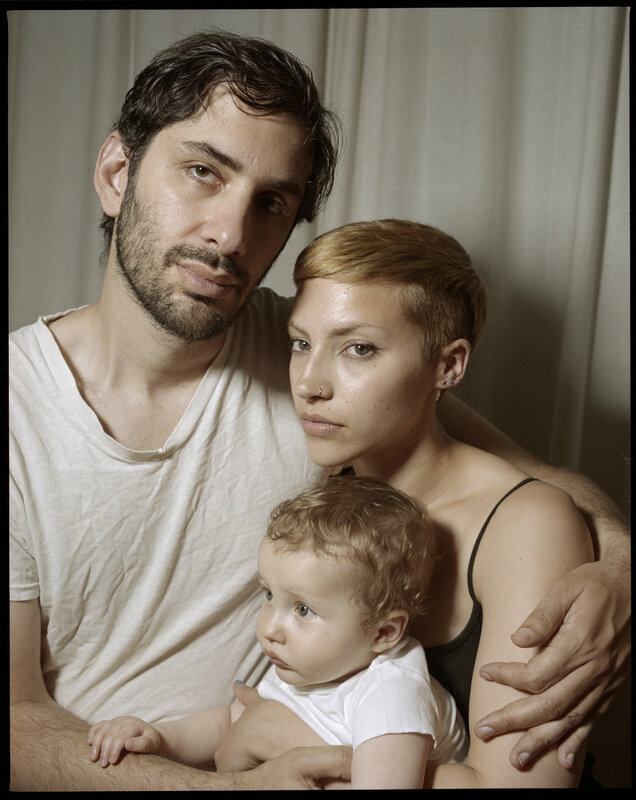 He presently lives and works in Brooklyn with his husband Anthony and dog Seneca. 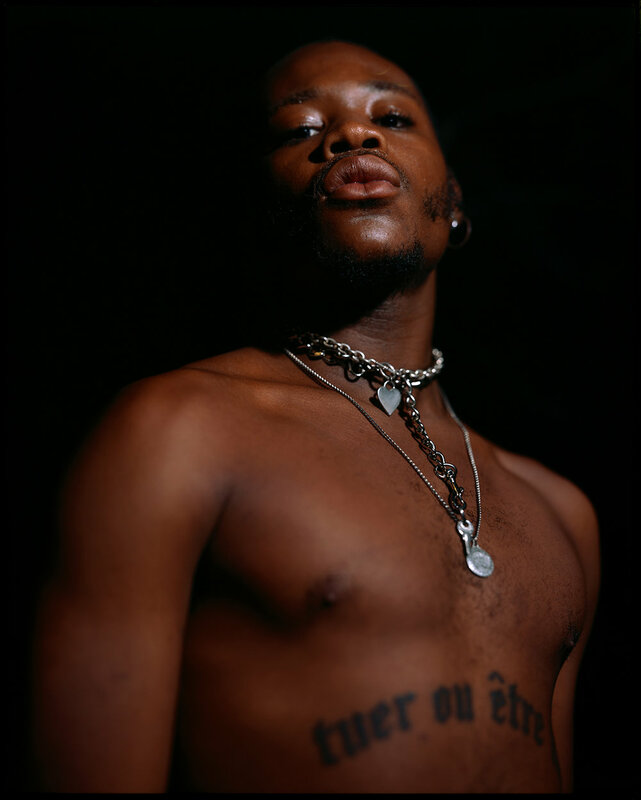 His work is about histories of pictures, bodies, and communities. 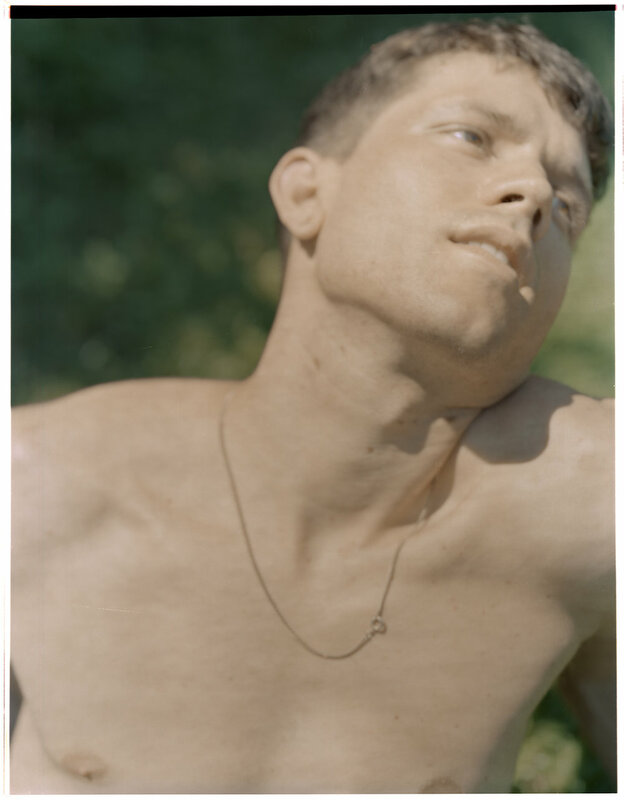 In my photographs, I negotiate a dialogue among several disparate concerns: intergenerational queer trajectories, reimaginings of family, self-worth as predicated by labor, and illusions of safety. I find that my access exists in a once- or twice-removed capacity. The pictures I take begin when I discover existing pictures. Poses and gestures in my work directly reference a quasi-image archive I compile from online or print. This archive evades hierarchies, and its images often carry an explicitly or subtextual queer lineage. I position the pictures I take as reenactments of those in this archive, responses to them given expanding contexts. The exacting and laborious sensibility required to operate the view camera setup provides an appropriate platform for the long and meditative analysis I feel the archival images command. A radical exchange of generosity and testimony can take place when a portrait is made. While the photographed body at large is, for me, a moment of personal revelation, it is also inevitably a certain vessel. I find I can't leave pictures alone. I extend the archive, enacting an analogy for photography's reactionary nature. In these ways, as a photographer, I engage with inherent power in making pictures, and responsibility and compassion are required in learning and telling. The medium of photography is apt territory for discussing histories of pictures, bodies, and communities, the ways they are mismanaged and abused, ways to resist and recover. A former instructor and mentor of mine advised me to apply to Purchase, as their photo program was starting to build up. I did the whole private art college thing for undergrad, and frankly I did not benefit from it, in fact I went into significant debt. The friends I made there were some of the only saving graces. For grad I knew I wanted to attend a state college. This may be an unpopular opinion, but I've found it most suitable for me to disengage from that narrative of the highly sought-after photography program housed in a private institution. Aside from my own baggage, Purchase is fantastic from many angles -- it's a small intimate program (there are 15 of us total across disciplines), so I've always felt like I had a voice here. It's affordable, it emphasizes pedagogy from a responsible and culturally competent place. Once I got here I realized I'd made the grad decision for reasons that worked for me. How has your experience at Purchase College informed or shaped your work? I came into the program having already been working on a long-term body of work for a few years. But part of my practice is that concerns, decisions, contexts, etc., change over time, so starting grad school in sort of unfamiliar circumstances has certainly enriched / informed the work. Having my studio there is fantastic just to have space to sequence and sort of live with the work. I live in Brooklyn and commute to Purchase which is in Westchester County -- a little more rural and less crowded than the city. Even just the environment has in that way changed things for me. Woods are good for portraits as well. Tons of artists live upstate or have their studios there, and I've heard of a good number of students and recent grads having some kind of assistantship or studio manager opportunities in that way. It's a pretty big school but I feel like it's easy to find your place and be in touch with people you'd down the line want to work with. Maybe it's because it's outside the city. Purchase also has a cultural center they started in Yonkers, and the incentive there is to bring in some art and art opportunities. The Gordon Parks Foundation is nearby -- I reallllly want to go. Recently I was TAing a class, and the inevitable questions came up for the students (who are in their 2nd or 3rd year of college) how they can expect to find shows, opportunities, etc., in the photo world. The instructor who I consider a mentor as well, said something to the effect of, it's wonderful when you get the opportunity to have a show, but think about how nice it is to not have a show. It sounds kind of silly, but I think he was alluding to the idea that these things take so much time and play and experimentation and trial and error. I think about what he said often with my work. While of course I want to have shows and have the work be visible, I don't mind it being a long-term process with a lot of boredom and mistakes in between. That's a foundational part of my process. What advice do you have for prospective students looking to attend Purchase College? If you're interested in teaching in an art program, I would look at Purchase -- the undergrad student body is also so gifted and making radical work. They really inspire me. We just made an Instagram account! We've been each doing a week-long takeover, and will probably have some more fun ideas soon. Elliot Brown, Jr., Thomas Locke Hobbs, Reina Gossett, Daniel Rampulla, Giancarlo Montes, Kim Westfall are who are really speaking to me at the moment. There's also an amazing studio and publication called Maroon World I'm so so obsessed with.